Right from combs, brushes, mugs, sunglasses and to bottles, we use an array of plastic materials every day. The precise manufacturing of these products is done through injection molding. The process is used by most of the manufacturers due to its multiple advantages which are many in number as compared to the other molding processes. In addition, the Plastic Injection Molding process is simple, reliable, efficient and versatile as compared to other molding processes. Plastic Injection Molding is the process of shaping plastic into a desired shape and geometry by putting the pellets of raw plastic into a mold. In the mold, the pellets get transformed into molten plastic due to high pressure and heat. Then, the molten plastic is allowed to cool and solidify within the mold. Thereafter, the solidified piece is released by opening the two halves of the mold. This process results in the formation of dimensionally accurate plastic products. Products such as house wares, toys, automotive parts, furniture, rigid packaging items, appliances and medical disposable syringes are manufactured through this process. The machines through which Plastic Injection Molding is performed operate under high pressure and this lets the molten plastic to press harder against the mold as compared to other molding processes. As a result, the molded design carries greater amount of detail including the geometry and the other features. The entire process of Plastic Injection Molding is much faster as compared to other molding processes. Hence, much less time is taken to generate more products from the same mold. The process of plastic injection molding is absolutely automated. This reduces labor cost that may be otherwise required to carry-out the process. Since the machinery used for Injection Molding is fully automated, the process is less complex as compared to other injection molding processes. In Injection Plastic Molding process, two types of plastic pellets can be molded at the same time. 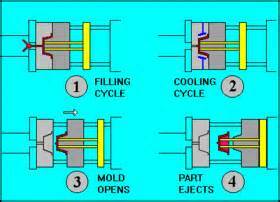 This process is known as co-injection molding. The post molding operation cost is usually very low if injection molding process is used. Very less waste materials are produced during the process of plastic injection molding. RSP Inc. is a China-based company known for excellent Graphic Overlays Design Engineering. The company is one of the topmost Plastic Injection Molding Manufacturers in China. It offers high-quality Injection Molded plastic in China. All the finished products of the company exceed the expectations of the customers. For details, simply browse through http://www.rspinc.mobi . Source: ArticleBase by Author Lorry Luos on behalf of RSP Inc., RSP Inc. is a manufacturer & supplier of products like custom membrane switch, silicone keypad manufacturers, rubber keypad manufacturers, custom printed circuit board, electro luminescent lamp, custom plastic injection molding, graphic overlays design engineering and much more. Related Article: What is Plastic Injection Molding?